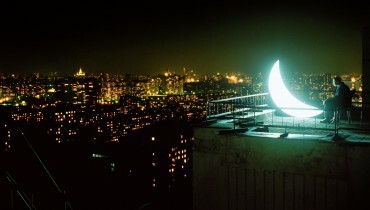 Leonid Tishkov was born in Nizhnye Sergi, on Urals Mountains, in 1953. He is a photographer, video artist, painter, book illustrator and a visionary narrator, at the same time ironic and poetic. Tishkov creates mysterious characters, taking us in an unpredictable world full of surrealist imagery and poetic humor. His works are mirrors of our own life, where we find distorted reflections of our fears and fantasies. Una mezzaluna russa è caduta a Milano.